The Caproni Ca.114 was a fighter biplane produced in Italy in the early 1930s which was flown operationally in Peru in the 1930s and 1940s. 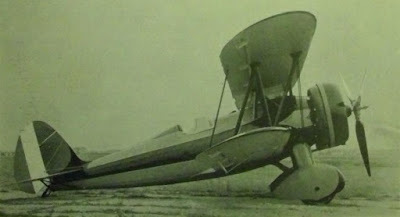 The Caproni company designed the Ca.114 in 1933 to compete against other designs to provide the Regia Aeronautica (Italian Royal Air Force) with a new single-seat fighter. 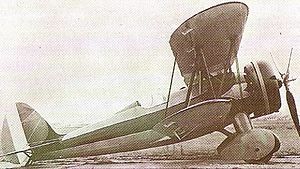 Its airframe was derived from the Caproni Ca.113 trainer, and it was a single-bay biplane with staggered wings of equal span. The fuselage was made of steel tubing covered by detachable metal panels in the forward part of the aircraft and by fabric in the after portion, and the two-spar wooden wings were fabric-covered. The Bristol Mercury IV radial engine was geared, supercharged, rated at 395 kilowatts at 4,000 meters (530 horsepower at 13,125 feet), and drove an adjustable-pitch three-bladed propeller. Armament consisted of two fixed forward-firing 7.7-millimeter machine guns. After official trials, the Regia Aeronautica rejected the Ca.114 in favour of the Fiat CR.32. Nevertheless, Caproni found a buyer in the Peruvian Aviation Corps, which ordered 12 examples in April 1934. These aircraft were delivered in two batches, the first in late November 1934, and the second in January 1935. These were pressed in service with the 2do Escuadron de Caza [2nd Fighter Squadron], part of Primer Escuadrón de Aviación [First Aviation Squadron] based in the newly created "Teniente Coronel Pedro Ruiz Gallo" in Chiclayo. Only a single loss was recorded by 1939, when the fleet was sent to the Caproni Factory in Lima to receive an overhaul. The heavy exhaust collector ring was discarded and replaced by individual exhaust stacks, which probably did something to improve the aircraft maximum top speed. Additionally, the original red-black scheme was replaced by a silver dope overall finish. Ten remaining aircraft took part, as part of the 42 and 43 Escuadrillas [flights], XXI Escuadrón de Caza [Fighter Squadron] along six more modern North American NA-50 fighters. After the war the Ca.114 were withdrawn from first line and four aircraft employed in training duties from Las Palmas airbase in Lima until late 1944 when they were grounded and, shortly after, scrapped.